In the spring it seems like my kids get invited to lots of birthday parties. The kids love them, but I dread having to pick a birthday present for each kid. I never know what kids already have or what they will like, so I have been trying to think of some handmade solutions for birthday presents. My first thought was a tote bag. I made this one for my son's friend Violet (who was turning 5) using this tutorial. I liked the pocket, but I thought the dimensions of the bag were a little weird and the strap was too long, My son was very excited to give her the bag and she seemed to like it. The next weekend we had a party for my daughter's friend Sofia who was turning 7. My daughter wanted to contribute to the fabric choices and had fun helping me pick out some rainbow-y fabrics. It's hard to tell from the photo but the rainbow portion of the pillow is a pocket. This pillow was quick and turned out pretty cute (at least I think so!) and I picked up a few more 14" pillow forms for future birthday parties. I am probably not going to have time to make something for every birthday part, but I do love how excited it made my kids about giving handmade gifts. I also like that it required more thought and effort from them than picking something up off the shelf. 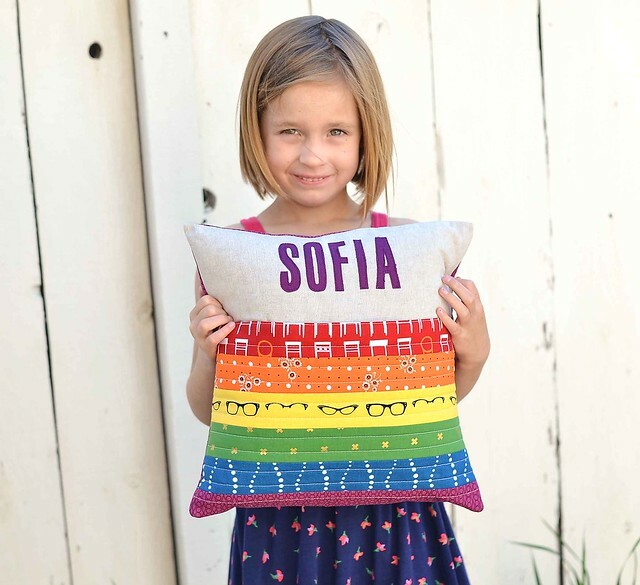 Do you have a favorite handmade gift for kids? I would love tot try out some new ideas for future parties. We used to give a lot of appliqued t-shirts. Easy, fast and well-like! We have the same predicament here and I love how the handmade gifts are unique and can be specialized for the recipient. I have made pocket pillows like you did here with a fun book inside and a small flashlight for nighttime reading. Another hit are zippered pouches or drawstring bags filled with small toys/stickers/candy/pencils,or nail polish/lip balm etc. for girls. I usually try to put the recipient's initial on the bag or use a novelty fabric that is specific to what they love. They have always been well-received. Thanks for sharing your ideas! These are fabulous gifts! Wish I had thought of this when my kids were young. 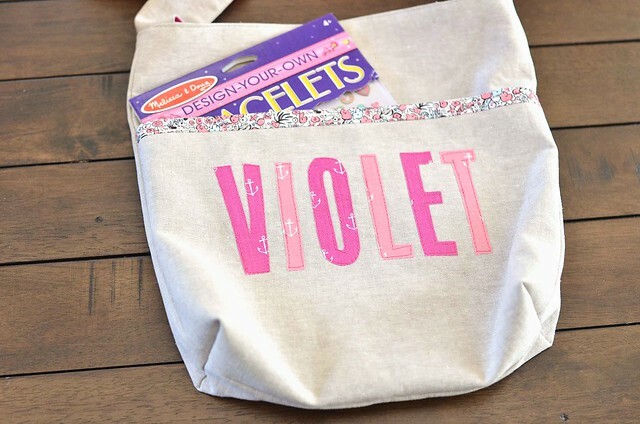 Could you continue to make totes and pillow covers and have some on hand to personalize when you get an invite? I think putting an appliquéd name on wouldn't take too much time. This has been on my mind too. I dislike shopping and enjoy using my stash instead of spending $$$$- so making something handmade is nice. So far I've done "super capes" with just one letter for the kids' first name. This past weekend I did tot-sized aprons because the mom mentioned she liked to cook and bake with her kids. SMS just posted a CUTE tute on making a patchwork sleeping bag for stuffed animals. Very cute! My 10 and 12 year old daughters have been making pouches for their friends. Then we fill it with random stuff (chapstick, gum, stickers etc). She picks through my scrap bind, does the cutting and stitching herself and then I put the zipper in and sew it together. Now that she's done it a few times she knows what to do and she can give her friend something personal and made by her. Your children absolutely love individuals, still Document terror difficult pick a personal gift from each boy. Document do not figure out what small children already have got or possibly the things the can want, for that reason I have been previously intending to think of a lot of homemade systems just for personal gift can present.